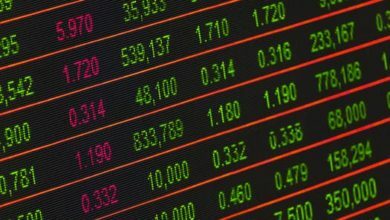 Made public on the 2nd of May, the European Commission’s proposals for the multiannual financial perspective for CAP 2021/2027 are sufficiently elliptical and opaque to suggest that the reduction envisaged for the CAP is small. Unfortunately this process did not work very long and many people have updated this manipulation which consisted in making believe that the decrease in appropriations was limited to 5% whereas the Commission presented its proposals in current euros1. The reality is quite different: the decrease in appropriations is 16.1% in seven years if we take inflation into account and use the budget standard, a 2% deflator. Specifically, this result corresponds to the difference between the average budget over the period 2014-2020 (sum of actual or planned budgets per year excluding the share of expenditure for the United Kingdom, divided by the number of years) and the budget. average announced for the period 2021-2027, all in constant euros (see Table 1). 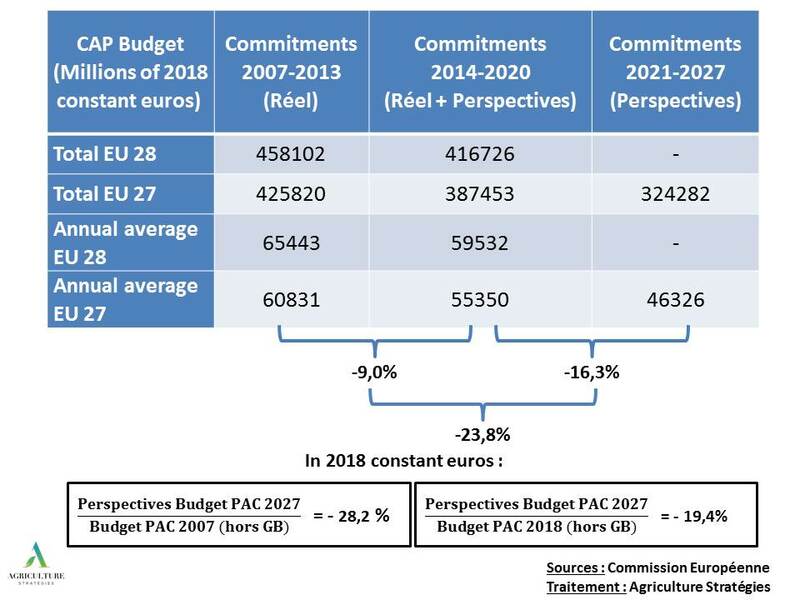 Presenting the current budget outlook in current euros had already helped to cover the reduction of the budget of the Community budget dedicated to agriculture between 2014 and 2020. We considered it useful to put into perspective this trend of continued budget restraint starting in 2007, the year that preceded the great food crisis of 2008 and soaring agricultural prices. Reported in constant euros in 2018, the decrease between 2007/13 and 2014/2020 was 9.2%. 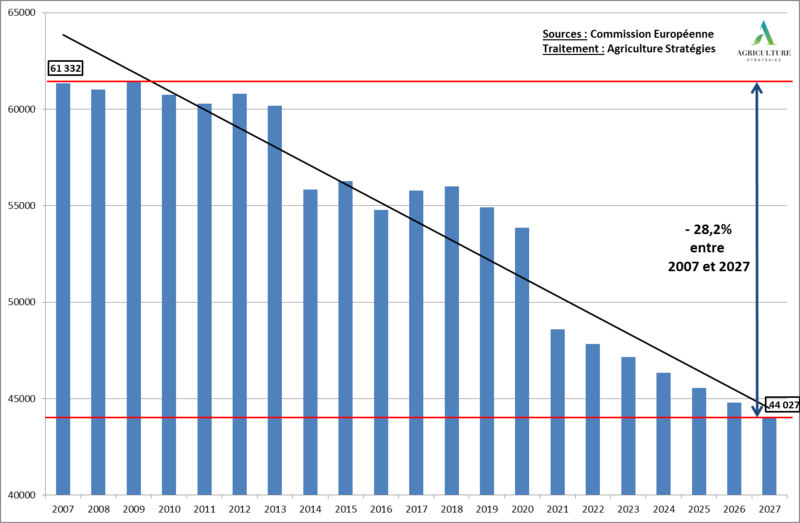 Thus, the decrease in average European budget commitments for the periods 2007-2013 to 2021-2027 for agriculture will have decreased by 23.8% in constant euros 2018 (Great Britain commitments deducted). On an ad hoc basis between 2007 and 2027, in constant euros 2018, this decrease will have been 28.2%. The curve below shows the fall in European agricultural budgets that nobody had measured yet. If, during the Health Check in 2008, the euphoria of the agricultural markets could lead to reducing the scope of the CAP budget to a period when the reduction or even the end of the public intervention was taken for granted. 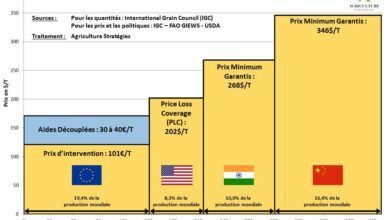 deep crisis of agricultural prices since 2014 makes incomprehensible the proposal for such a drastic decline. And this makes it all the more perplexing that the other major agricultural powers have, on the contrary reinforced their support for agriculture, especially China: from 2008 to 2015 public support for agriculture and food increased 84% in CNY or 108% in USD, while the United States maintained them at a much higher level than the European Union ($ 486 per capita in the US against $ 198 in Europe in 2015). As if this sprinkling would spawn new policies when they are not integrated and it is more alibis than common decisions. The result is however catastrophic because to finance 10 billions of British contribution and 15 billions devolves to these new programs one undresses the CAP as well as the cohesion funds. Worse, and this is reflected in the recent forum of Jean Pisani Ferry in the World, the CAP would no longer be considered strategic and should be renationalized. 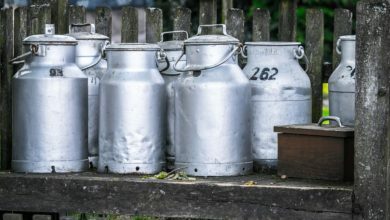 Rather than making a critical judgment on a direction of the CAP for two decades, the economist prefers to paint a more than caricatural picture of French agriculture defined as “uncompetitive, late, with a worrying ecological balance sheet afflicted with a slow transition to organic “. These final judgments, bury by ignorance and disinterest a CAP of which those who wear them have never sought to understand the utility. This would probably jeopardize their certainty about the value of withdrawing from public intervention and the use of markets, which by definition are perfect. The Commission is clearly in this direction, with the CAP having to be legitimized, with stronger environmental, social and territorial guarantees, as if the food service were no longer important. Thus Mr Pisani Ferry and his fellow-comrades are caught in their own trap, that of having reduced the CAP to a social policy of distribution of aid. And, rather than calling into question the trajectory started in the early 1990s, they advocate a renationalisation of the CAP that can not be interpreted otherwise than as a deviation from the principle of subsidiarity. Agriculture Strategies, far from these deadly judgments and the progressive abandonment of the CAP that Brussels would like to encourage the Member States to support, brings a fundamentally different solution carrying a real European added value. 1 It is recalled that a forecast in current euros creates the illusion of a generally stable budget while under the effect of inflation the value of the currency decreases. Thus with inflation of 2% per annum the budget value for 2027 is mechanically reduced in currency from 2021 to 11.2% less. This sleight of hand, added to the 5% decline announced by the Commission, means that the overall decrease in constant value is 16.1%, which is what we calculated and presented in Table 1.